Invest in a Good Cover. Make sure your hot tub cover is well-insulated and has a tight-fitting seal. A high-quality cover in good condition will help your hot tub maintain a constant high temperature, even when the weather is frightful. For Replacement covers Please Visit Quickspaparts.com as they carry certifies American Spa Brand covers in the correct sizing for your Spa. Keep the Water Clean. Make sure you clean and maintain your water and filters according to your usual schedule. Simple problems can become more complicated to fix in subzero weather. Our Blog has a basic maintenance schedule that you can always refer to for Spa Maintenance. Turn Down the Jets.Use the jets to a lesser extent than you would in other seasons, and don’t forget to turn them off when not in use. The jets work by blowing air into the water, which can lower the temperature. Additionally Keep in mind there are many winter spa health benefits, but you still want to be safe. When you’re undergoing hydrotherapy in an outdoor portable spa, make sure to spend no more than 20 minutes in your spa at a time. (There are health benefits to hot-and-cold therapy, too, but you should see a doctor before starting any kind of regimen.) Drink plenty of water, and avoid alcohol; you can become dehydrated more quickly if you drink too much while hot tubbing. Keep your spa around 100 degrees (unless a doctor says otherwise) so that your temperature is consistent, and make sure to perform routine maintenance and cleaning. 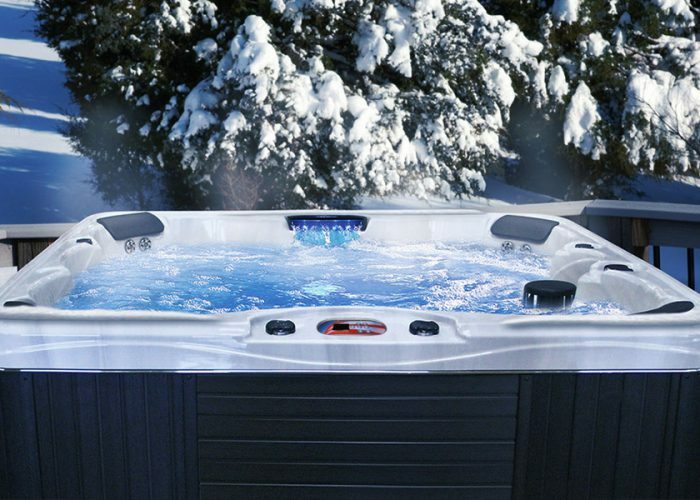 Soaking in a dirty hot tub in winter or in any season can lessen the benefits. The most important thing to remember about using a hot tub in winter is to have fun! Spas are a big investment, and you should get the most out of your purchase. Few things have as many health benefits as happiness – so sit back, relax and enjoy your spa this winter! Check back in the following weeks as well will talk about the Fun Benefits of Owning an American Spa in Winter Subscribe now & Follow us on social Media! Contact us below if you have any additional American Spa Questions.